In its 4Q (October-December) 2012 report for Tablet devices announced today, CMR reported that India sold 1.09 million units for the period, which accounted for 35.33% of the total shipments for the entire year. 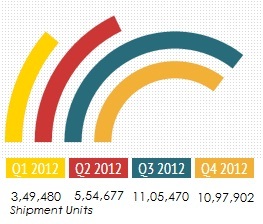 At the same time, shipments for the full CY 2012 clocked 3.11 million units. CMR (CyberMedia Research) was the first market intelligence and consulting services firm in India to launch a Market Review Programme for Tablet devices and has been pursuing this since October 2010, when Tablets were first launched in India. Since then, the Tablets market has seen rapid changes particularly with the emergence of the ‘Phablet’ segment. In 2012, ‘Phablets’ constituted around 16.5% of total sales and this trend is expected to strengthen in the coming quarters. Moreover, the user profiles, market dynamics and the product orientation of ‘Phablets’ are very different from that for Tablets. In the light of these trends, CMR has decided to red-segment the Tablets market into two separate segments – Phablets and Tablets – starting CY 2013. 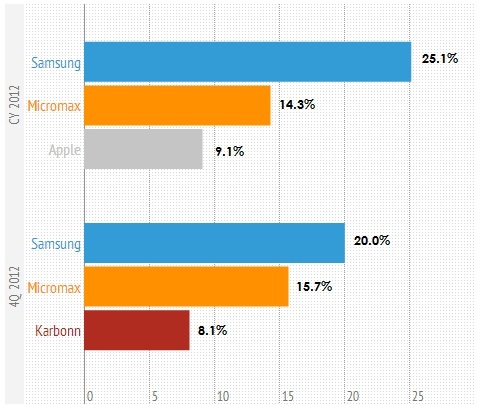 As per the existing CMR definition, the rankings for the India Tablet Device market (5-inch screen size and above) for CY 2012 and 4Q 2012 are given in Figure 2 below, listing out the shares of top three brands. “This is also proved if we look at the same market with the new perspective of ‘Phablets’ being a separate and distinct category, based on the revised CMR definition for Tablets starting CY 2013. 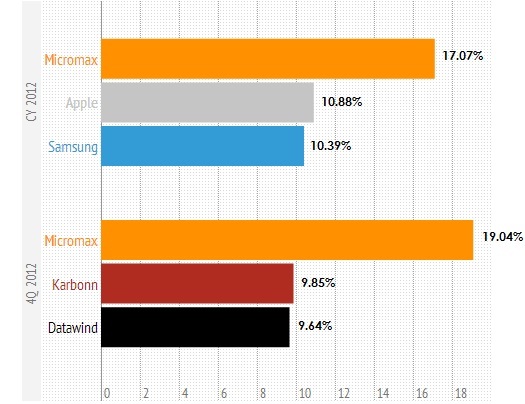 The market rankings for CY 2012 and change altogether with Samsung witnessing a major change in its standing. So if Samsung has to be a strong brand in the Tablet market, it has to adopt a long term sustainable strategy along with nurturing the ‘Phablets’”, concluded Tarun. 1) This release is a part of the CyberMedia Research (CMR) Smart Mobility Market Programme. 2) CMR uses the term “shipments” to describe the number of Media Tablets (Tablet PCs) leaving the factory premises for OEM sales or stocking by distributors and retailers. For the convenience of media, the term ‘shipments’ has been replaced by ‘sales’ in the press release, but this reflects the market size in terms of units of Tablets and not their absolute value. In the case of Tablets imported into the country it represents the number leaving the first warehouse to OEMs, distributors and retailers. CyberMedia Research does not track the number of Tablets brought on their person by individual passengers landing on Indian soil from overseas destinations or ‘grey market’ tablets. These are, therefore, not part of the CyberMedia Research numbers reported here. 3) CyberMedia Research tracks shipments of Tablets of screen size 5″ and higher, starting 4Q (October-December) 2010. 4) Starting January 2013, CMR will track and report two separate categories of devices – Tablets (7-inch and above screen size) and Phablets (5-inch and above). 5) Since the ‘Phablet’ category of devices were introduced in the last quarter of 2011, the market standings for 2010 and 2011 will remain unchanged, even after revision of the CMR Tablet Device category definition, as explained above.